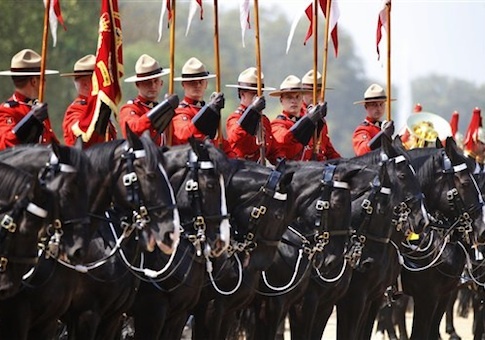 The Royal Canadian Mounted Police (RCMP) rejected and distanced itself from the force’s own an anti-terrorism handbook just a day after it was released, citing the manual’s "adversarial tone." The "United Against Terrorism" handbook released last week by the RCMP and two Canadian Muslim groups seeks to combat the rise of radicalism in local Muslim communities and serve as an antidote to the slick extremist propaganda being produced by terror groups such as the Islamic State of Iraq and the Levant (ISIL or ISIS). However, a day after its official release, the RCMP publicly distanced itself from the handbook and said it would not distribute it to officers. While it remains unclear what exactly the RCMP objected to, questions have been raised about sections of the handbook that order the police not to use terms such as "Islamic extremism" and tell Muslim community members that they do not need to cooperate with the police. Other sections of the handbook say that terrorists are not "jihadis" and that "jihad is a noble concept." A day after the anti-terror handbook was released with much fanfare in Canada’s Muslim community, the RCMP issued a statement rejecting the publication for its "adversarial tone," a loaded comment that the police force has declined to explain. "After a final review of the handbook, the RCMP could not support the adversarial tone set by elements of the booklet and therefore directed RCMP Manitoba not to proceed with this initiative," the police force said in a statement posted on its website. The RCMP is keeping mostly silent on the matter and directing questions to the two Muslim organizations behind the handbook, the National Council of Canadian Muslims (NCCM), and the Islamic Social Services Association (ISSA). "Any questions regarding the distribution, use or intention of the booklet should be directed to the authors, the National Council of Canadian Muslims, and the Islamic Social Services Association," the RCMP said in a statement that raised more questions than answers. One potential issue is that the handbook recommends that "intelligence and law enforcement officials" should "avoid terms such as ‘Islamist terrorism’, ‘Islamicism’, and ‘Islamic extremism’ in favor of more accurate terms such as ‘al Qaeda inspired extremist,’" according to one section of the handbook, which still bears RCMP’s official logo. Law enforcement officials also should "discontinue any inappropriate information gathering techniques including (but not limited to) showing up at workplaces, intimidating newcomers, questioning individuals religiosity, and discouraging legal representation," the anti-terror handbook states. The term "jihad" also is not appropriate to use, according to the handbook, a copy of which was first published by Canada’s CBC News. "Do not refer to terrorists as ‘jihadis,’ the manual states. "This only emboldens them and gives them a legitimate status in the eyes of the vulnerable. Terrorism is not jihad. Jihad is a noble concept in Islam." The handbook also tells those in the Muslim community that they are under no obligation to speak to the police about potential extremist individuals. "Your cooperation with [Canadian Security Intelligence Agency]/RCMP is voluntary," the handbook states. "You have no obligation to talk to CSIS/RCMP, even if you are not a citizen." "Refusing to answer questions cannot be held against you, nor does it imply that you have something to hide," the handbook says. "If you choose to answer questions, it is advisable to have a lawyer present." One also does "not have to permit CSIS/RCMP representatives to enter your home or office," according to the handbook. "They must possess a search warrant in order to enter your property. If they say they have a warrant, ask to see it before allowing them to enter. Even if they have a warrant, you are under no obligation to answer questions." Muslims approached by the police or intelligence community are "not required to provide personal information about friends and family," according to the handbook. "You should feel free to tell the officer that you will not provide information about others without their consent." The RCMP, for its part, distanced itself from every section of the handbook that it did not directly contribute to. "The RCMP contributed to Section 3 of the handbook entitled ‘Understanding Radicalization and the role of RCMP in law enforcement and national security,'" the statement said. "We are not responsible for other material contained in this publication." Requests for comment made to the NCCM and ISSA were not returned. The RCMP declined further comment. Officials from both Muslim community groups behind the handbook say that it has been well received in the community, according to comments published by the Globe and Mail. "We have received enthusiastic support for this initiative from Canadians across the country and countless requests to distribute the handbook in our diverse communities," the paper quoted Ihsaan Gardee, executive director of the NCCM, and Shahina Siddiqui, president of ISSA, as saying. When approached for comment by Canada.com, the RCMP said it had not agreed to avoid terms such as "jihad." "The RCMP hasn’t issued any guidance or guidelines to other departments, nor has it agreed not to use terms such as ‘Islamist terrorism,’ ‘Islamic extremism,’ or ‘jihad,’" it said in a statement to the news site. However, it does not appear that the RCMP raised concerns about the handbook during a 14-month development and review period in which information was shared with all the handbook’s contributors, the Globe and Mail noted. Terrorism analyst and reporter Patrick Poole said that this type of confusion is commonplace when authorities in both the United States and Canada have attempted to work with Muslim community organizations. "This episode of government officials engaged in Islamic outreach only to have it blow back on them shows this is not a uniquely American phenomenon," Poole said. "Why was it that only after the publication's release and the public criticism that followed that they withdrew their support? "Even though they have retracted their endorsement for this publication, their name remains on it, and the initial media blitz tied them to it," Poole said. "This is exactly how government's legitimize, even unwittingly, extremist ideology through outreach." A similar occurrence was revealed in 2010, when an Ohio Department of Homeland Security official was grilled before Congress for issuing two pamphlets that minimized the danger of jihad and blamed hostility in the Arab world on Israel, according to the Investigative Project on Terrorism (IPT).